A day-by-day account of the Michael Jackson trial with all the key evidence, quotes and witnesses. Key witnesses: Joy Robson and Marie Barnes, whose sons, Wade Robson and Brett Barnes, visited the Neverland ranch in the early 1990s. Key quotes: The defence called the mothers of Wade Robson and Brett Barnes, who both gave evidence on Thursday denying they had ever been molested by Michael Jackson. Joy Robson told the jury that Mr Jackson's love of children was "very pure" and she trusted him with her son. "He's a very special person," she said of the singer. "I feel like he's a member of my family." Mrs Robson rejected the prosecution's suggestions that she thought Mr Jackson would help her son, now a dancer and film director, break into show business. However, she admitted her family had received financial help from the star and that he had helped organise a recording deal for her son. Marie Barnes followed Mrs Robson into the witness box and told jurors she trusted Mr Jackson "implicitly" with her son. "He's a very nice person," she said of Mr Jackson. "You just know when you can trust someone." Wade Robson's sister Chantal and Brett Barnes' sister Karlee also testified on Friday in the singer's defence. Chantal Robson said she slept in Mr Jackson's room with her brother four times as a child and had never seen anything of a sexual nature. Karlee Barnes, meanwhile, said she and her family had been flown from Australia to testify at the trial and were staying at Neverland. "I love him with all my heart," she said of Mr Jackson. Key witnesses: Dancer Wade Robson, 22, and Brett Barnes, 23, both regular visitors to the Neverland ranch in the early 1990s. Key quotes: Defence lawyers asked to have all charges against Mr Jackson thrown out, calling testimony from alleged victim Gavin Arvizo and his brother Star Arvizo was "inherently improbable". He added that their mother Janet Arvizo had been a "bizarre" witness who told a "whopper". The defence motion stated that prosecutors "failed to present sufficient evidence of a conspiracy" by Mr Jackson to hold the Arvizo family captive. Judge Rodney Melville denied the request to dismiss the charges. The defence called witnesses Wade Robson and Brett Barnes, regular visitors to Mr Jackson's Neverland ranch in the early 1990s who admitted sharing a bed with him. When asked whether Mr Jackson had molested him "at any time", Mr Robson replied: "Absolutely not." "Did Mr Jackson ever touch you in a sexual way?" defence lawyer Thomas Mesereau asked. "No, never," Mr Robson said. Prosecutor Ron Zonen asked him: "What you're really telling us is that nothing ever happened while you were awake." "I'm telling you nothing ever happened," Mr Robson replied. When asked whether he had been touched inappropriately by Mr Jackson, Mr Barnes replied: "Never, I wouldn't stand for it." He said he was "very mad" that previous witnesses testified that they had seen Mr Jackson touch him inappropriately. "It's not true and they put my name through the dirt. I'm really not happy about it," Mr Barnes said. 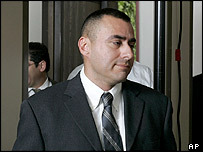 Key witness: Music producer Rudy Provencio. Key points: Mr Provencio - the final witness as the prosecution wrapped up its case - said the singer's camp feared his career would be ruined after a documentary making child abuse allegations was aired in 2003. But he was unable to prove that Mr Jackson played a direct role in a plot to hold accuser Gavin Arvizo's family at his ranch. Mr Provencio told the court that he had overheard the singer's associate Marc Schaffel say that "killers" were pursuing the Arvizos. But another Jackson aide, Vincent Amen, told him there were no killers. After the prosecution finished its case, Mr Jackson's lawyers filed for an acquittal on the grounds the charges had not been proved. The motion will be heard by Judge Rodney Melville on Thursday, and if successful, the defence case will begin. Witnesses: Sheriff's Sergeant Steve Robel, forensic accountant John O'Bryan, music producer Rudy Provencio and Mr Jackson's associate Marc Schaffel. Key quotes: Prosecutors asked Sgt Robel how Mr Jackson's ex-wife Debbie Rowe had described the singer in a police interview he conducted with her last year. "She referred to Michael as a sociopath and his children as being possessions," Sgt Robel said. He said Ms Rowe had told him she and Mr Jackson had made "a plan" following their divorce in 1999. It involved an agreement that she would "talk positive about Mr Jackson" in all public statements, he said. Forensic accountant John O'Bryan said that in 2003 Mr Jackson's annual expenditure was up to $30m (£15.8m) more than his income. "There was an ongoing cash crisis, not enough cash to pay bills," Mr O'Bryan said. 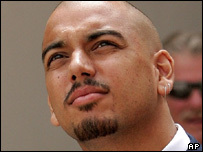 Prosecutors suggested that Mr Jackson took part in Martin Bashir's 2003 documentary in order to boost his finances. But defence lawyer Thomas Mesereau asked Mr O'Bryan: "Let's say he has the opportunity to make a documentary that will generate $7m. That $7m is not going to make much of a difference (in Jackson's financial liabilities)." "No, it's not," Mr O'Bryan agreed. Rudy Provencio began describing working with Mr Jackson and Marc Schaffel talked about Mr Jackson's June 2001 plans for a charity recording called What More Can I Give. Key evidence: The jury was shown telephone records of calls made during the weeks following Martin Bashir's documentary Living With Michael Jackson, which was broadcast in the US in February 2003. Prosecutor Mag Nicola showed jurors records of calls between the phones of three men named as unindicted co-conspirators; Janet Arvizo, the mother of the alleged victim; and a number of Mr Jackson's employees and lawyers. The first series of calls occurred during a trip to Miami by Mr Jackson, his entourage, the accuser and the boy's family. During cross-examination Detective Craig Bonner admitted there was no way of determining if Mr Jackson took part in the calls. Bank manager Beverly Wagner said one of Mr Jackson's top associates Marc Schaffel cashed two cheques worth £790,000 in the space of a week. The account was controlled only by Mr Schaffel and Mr Jackson. Ms Wagner said she authorised the transactions in the first week of April 2003 but had no idea how the money was used.